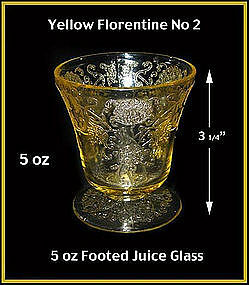 Florentine No 2 yellow footed juice glass in excellent condition, made by Hazel Atlas Glass Co. in the 1930's. Excellent! 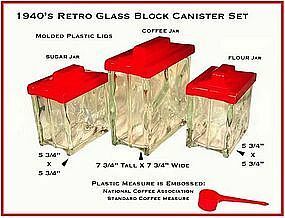 1940s retro kitchen, red and crystal glass block COFFEE, TEA, and SUGAR jars with embossed red plastic coffee measure and red plastic lids. 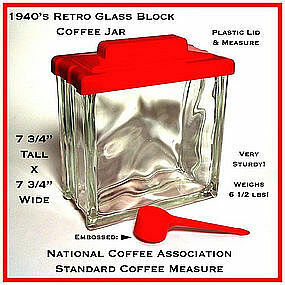 These are a very sturdy jar set that weigh 14 lbs! The cat won't knock these over! ... The glass is very clear and without damage. No labels on jars so we assumed the names. Very 40's deco! 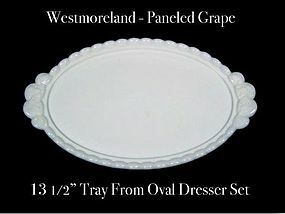 WMG Paneled Grape HTF Large Oval Dresser Set Tray-Nice! This 13 1/2” white milk glass Paneled Grape dresser set tray was made by Westmoreland Glass in the 1950s. It is in excellent condition, and the glass is very bright and shiny with no damage! Estate Fresh from here in NW Ohio! We will gladly combine shipping on multiple purchases. 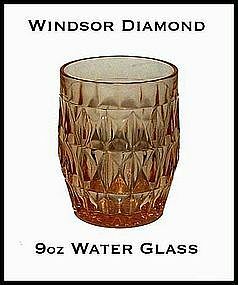 Made by Jeannette Glass in the 1930's, this pink Windsor 9 oz water glass is in excellent condition! 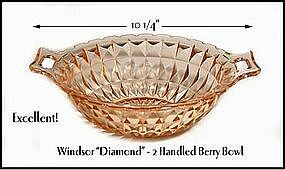 This very large PG 83 WMG Paneled Grape 11 1/2" Footed Fruit bowl is in excellent condition. It was made by Westmoreland in the 1950's and weighs over 5 lbs. Very hard bowl to find! 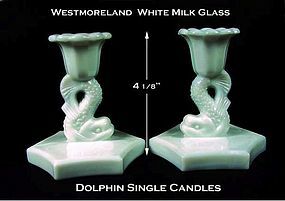 This pair of white milk glass candles were made by Westmoreland Glass Co before 1950. They are in excellent condition! These are very high detail and flawless! 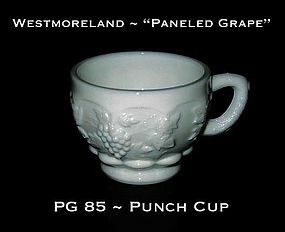 This Westmoreland Paneled Grape PG 85, punch cup is in excellent condition! Fresh from an estate here in NW Ohio. 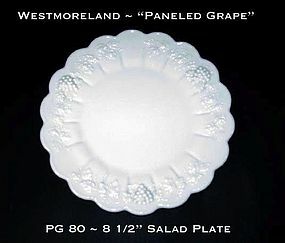 This Westmoreland Paneled Grape PG 80, 8 1/2" salad plate is in excellent condition! Fresh from an estate here in NW Ohio. 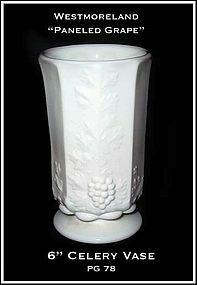 This WMG 6" Celery Vase is in excellent condition! 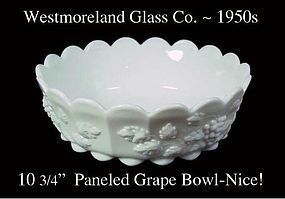 It was made by Westmoreland Glass Co. after 1940. 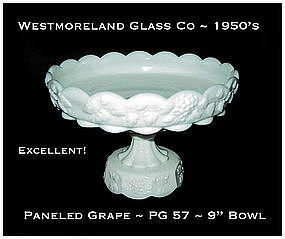 This Westmoreland Paneled Grape cupped and footed 8" bowl is in excellent condition! Fresh from an estate here in NW Ohio. This white milk glass stemmed 9" bowl was made by Westmoreland in the 1950's. 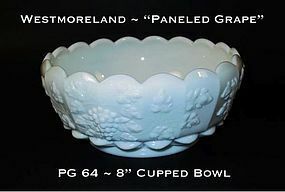 It is listed as # PG 57 bowl, and is in excellent condition! 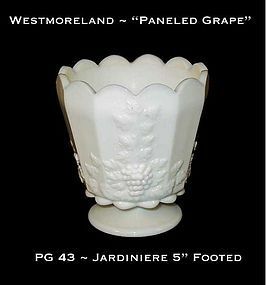 This Westmoreland Paneled Grape PG 43, 6" Jardiniere is in excellent condition! Fresh from an estate here in NW Ohio. 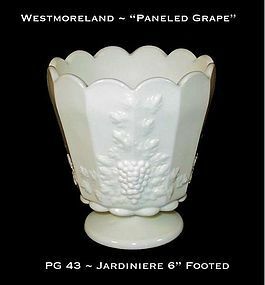 This Westmoreland Paneled Grape PG 42 Jardiniere is in excellent condition! Fresh from an estate here in NW Ohio. 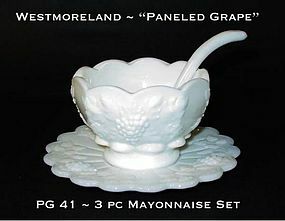 This Westmoreland Paneled Grape 3pc mayo set is in excellent condition! Estate fresh from here in NW Ohio. 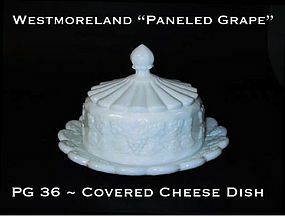 This Westmoreland Paneled Grape covered cheese dish is in excellent condition! 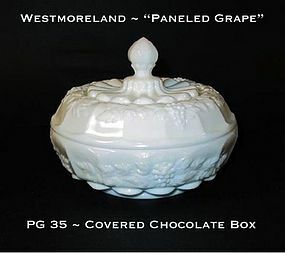 This Westmoreland Paneled Grape covered chocolate box is in excellent condition! Fresh from an estate here in NW Ohio.